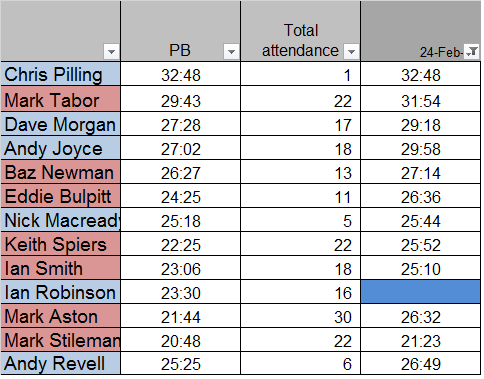 Well done to everyone who ran the February handicap and apologies for the delay in publishing the report. First of all, welcome to Chris Pilling, running his first (of many we hope) handicap. From a potential field of 22 runners it slowly diminished during the morning, due to illness or last minute meetings, to 12 participants. Baz asked for an early start in order to attend a meeting. Keith S and Mark A requested their start times brought forward a couple of minutes due to carrying injuries and would be “taking it easy”. Weather conditions were clear and dry with a slight NE breeze, so the chance of a PB or two were good. Sadly that proved not to be the case with even mighty Mark Stileman 35 seconds outside his PB. Even Andy J’s shiny new trainers (I think that colour’s called swarfega green, Andy) didn’t help him, coming in 2:56 outside his PB. Things can only get better! The only way is up! Keep on running! Baz has asked for a special mention as he has taken the lead (from James Clarke) in the current consecutive attendances competition, having not missed an event since last August. I get the impression this is a title he intends to retain for some time, but should he miss the next event then the metaphorical crown will pass to Ian Smith. Finally, a big thank you to Ian for timing and report writing for this event.